The new PHX Sky Train®﻿ automated people mover system provides a new LEED Gold prototype for airports seeking modern transit solutions. By bringing transit directly into one of the nation’s busiest and most urban airports—Sky Harbor is located just three miles from downtown Phoenix—the PHX Sky Train®﻿ serves as more than just a hub for smart transit or transit-oriented development. It establishes a new framework for the city’s long-term growth. The first of three planned stages, Stage 1, travels a 1.7-mile route linking Phoenix’s METRO light-rail station with the airport’s economy parking structure and the 88-gate Terminal 4. HOK designed the new 44th Street station, the station inside Terminal 4 and an outdoor station in the economy parking area. Our station design focuses on helping passengers have a stress-free, pleasant experience. Gannett Fleming, the project’s design lead/engineer, designed the rail system and bridges. The simple beauty of aircraft design inspired the architectural form of the 44th Street station, which provides an iconic public gateway to the airport. The station’s streamlined shape relates to the trains while accommodating a public art program. Because the elliptical shape is structurally more efficient, it allows for a 30 percent reduction in steel compared to more conventional structures. The elliptical shell also functions as a high-performance envelope, protecting passengers from the extremes of the desert climate. This is the first automated people mover system to receive a LEED-NC Gold rating. The electrically powered, automated PHX Sky Train®﻿ is expected to reduce the airport’s greenhouse gas emissions by nearly 6,000 tons a year. The three stations will use 30 percent less power than an established baseline. The design allowed for carefully phased construction so the construction team could insert the stations into a fully functional airport without interrupting its operations. Future phases will add two stations and three miles of track. The PHX Sky Train®﻿ won a top honor in the Arizona Forward Environmental Excellence Awards, receiving the first-place Crescordia award in the Multi-modal Transportation & Connectivity category. A public art project featured on one of the PHX Sky Train®﻿ pedestrian bridges received special recognition. See the Phoenix Sky Harbor International Airport on Google Maps. 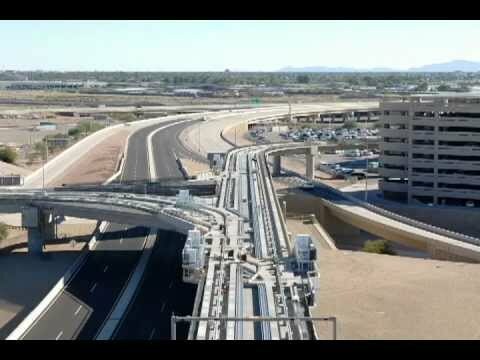 Watch an animated flyover of the train route for the new PHX Sky Train®﻿. Visit the official website for the PHX Sky Train.